Allow me to wish you a wonderful Thanksgiving weekend with family, friends and great food. The next few weeks will fly by as we enjoy a busy holiday schedule. May I add to your calendar? If you reside in the city of Laguna Beach, the OC Register announces next week’s speaking engagement with the Laguna Beach Republicans in the piece below. I’ve had a packed speaking calendar during the recess, as it’s fun to share what’s happening in Sacramento. This past year has been an incredibly memorable one and there’s plenty to talk about. What the supermajority has done to this state is so disappointing. I’m thankful I survived. P.S. You don’t have to live in Laguna Beach to attend. Come and do some Christmas shopping in this art gallery laden coastal gem. In fact, my featured 2015 artist is Wyland, and one of his pieces is now hanging in the Maddy Lounge, just off of the Senate Chambers. Please visit his studio and congratulate his staff. 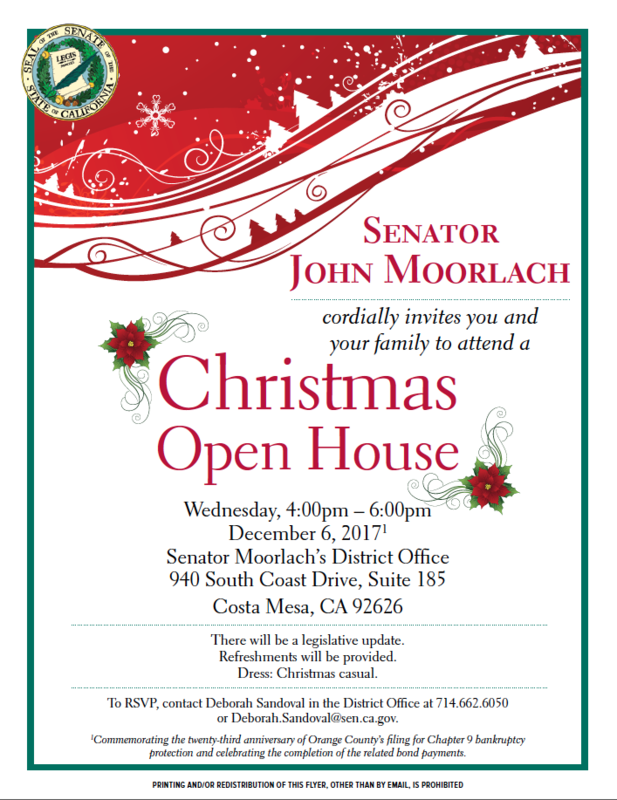 If you live in the 37th Senate District, and you know who you are, please visit my District Office for our annual Christmas Open House on December 6th. We will commemorate the 23rd anniversary of the County’s filing for Chapter 9 bankruptcy and the fact that the last installment of the bankruptcy-related bonds were paid off this year! Now, that is something to be truly thankful for. An invitation is provided below. P.S. You don’t have to be a resident of the 37th Senate District to attend. Since our office is across the street from South Coast Plaza, Crystal Court and MetroPointe, enjoy some of the most amazing Christmas shopping venues in the nation. The Laguna Beach Republicans will hold its monthly meeting on Nov. 30 at Mozambique, 1740 S Coast Highway. Social hour starts at 5 p.m., meeting is at 6 p.m. State Sen. John Moorlach will give an update from Sacramento on topics such as the gas tax hike, sanctuary state movement and the pension situation. RSVP to highspeed8.